Did anyone notice during this year’s “Summit Season”, from Singapore, to Port Moresby and Buenos Aires, that there is something unique about the way Australia’s 30th prime minister comports himself on the world stage? It’s called a notebook — a little black-covered one that Scott Morrison took with him to almost every major engagement. Perched in those uncomfortable-looking armchairs that pop up annually at the G20, the East Asia Summit and at APEC, whether talking to New Zealand’s Jacinda Ardern or the Netherlands’ Mark Dutte, that notebook was never far away. Its presence, and the Prime Minister’s reliance on it, was a subtle reminder that Mr Morrison is less than sure-footed on the finer arts of statecraft, is sufficiently aware of his foreign policy “blind-spots” to leave nothing to chance, and is less innately comfortable on the stage than any of his recent predecessors in office. Few of the more seasoned presidents and prime ministers he met would so routinely rely on a written set of speaking points to glance down at except, say, the German Chancellor — who needed a pictorial prompt to be reminded exactly who the Australian PM is these days and what he looks like. To be fair, in assessing the Prime Minister’s debut summit season there are good reasons why a pre-prepared diplomatic “script” might be helpful, especially on the final leg of the trifecta of regional gatherings that ended in Argentina. 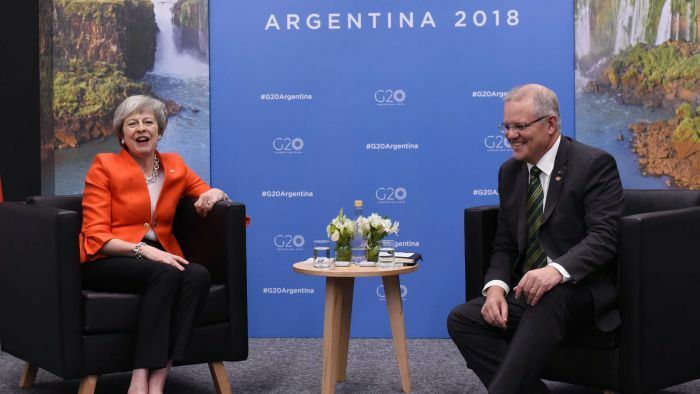 Mr Morrison had shuttled to Argentina no fewer than three times in its G20 host year; twice as treasurer and, only on the third dizzying time to the summit, as a prime minister barely three months in office. As Australia’s top foreign policy “actor” on the stage, the G20 Summit exposed flaws in Scott Morrison’s repertoire that hadn’t been obvious in earlier outings on the Asian side of the Pacific. Where he had charged into the APEC Summit in PNG armed with an arsenal of military bases, infrastructure funds and near-limitless largesse for poor island nations, in Buenos Aires there was always that niggling feeling that Australia came armed with a lettuce knife for a gun-fight. Plainly, the Prime Minister had a “script” for his place among global economic heavyweights, but no compelling “story” to convey to any of them. More disturbingly, there appeared to be a weariness on the part of the most powerful leaders who may have lost the appetite for getting to know an Australian prime minister, given the staying power of Mr Morrison’s predecessors. The evidence comes in the truncated time Mr Morrison spent in the glimmering South American capital and in the bilateral meetings his team was able to secure for him while he was there. Out of sheer political caution and necessity at home, the Prime Minister was intent on customising his visit to miss no time in Canberra for Parliament’s final sitting fortnight for the year — out Thursday, back Monday, with Mathias Cormann in tow. This meant less than two full business days spent in Buenos Aires on Friday and Saturday. And then there’s the list of leaders he was able to spend time with. The PM left Australia apparently resigned to missing out on the formal meeting with US President Donald Trump which Vice President Mike Pence had promised — there were “no pressing bilateral issues at present” so “no pressing need for a formal bilateral at this stage”, his office explained. In the event, determined work by intermediaries ensured Mr Trump did make 20 minutes of his time available to meet the second Australian prime minister of his presidency. Time was clearly short, which might explain why — in the presence of reporters — Mr Morrison could summon only 13 seconds of remarks on the Australia-US alliance while President Trump meandered through 33 seconds: “We have just gotten to know each other and so far, so good” fairly summing up the lack of familiarity before Mr Trump felt the need to make private “inquiries” about what happened to Malcolm Turnbull. Call it diplomatic vanity, but who in the world’s top 20 power elite a leader gets to meet is a measure of their success at these summits and after Donald Trump, the Australian Prime Minister’s list fell away sharply. There was Theresa May, facing her own date with Brexit parliamentary destiny in Westminster within weeks, then France’s Emmanuel Macron, the outgoing President of Brazil, the Secretary-General of the OECD, the World Trade Organisation, Chancellor Merkel (awkwardly), the Netherlands’ Prime Minister and the twin EU leaders of Donald Tusk and Jean-Claude Juncker. Conspicuously, there was no formal gathering with China’s Xi Jinping in Argentina, only an introductory chat between a photo and the main summit working session, after similarly brief encounters with the President in Port Moresby. Then there was the troublesome experience of the Middle-East “policy review” to shift Australia’s Israel Embassy from Tel Aviv to Jerusalem. Launched in the blush of the October Wentworth by-election, it was torpedoed by Indonesia and Malaysia in Singapore, then half-submerged by the time Mr Morrison got to chat to Theresa May about it in Buenos Aires, and listing badly afterwards. For a Prime Minister preparing to campaign for an against-the-odds re-election of his minority Coalition Government, it could hardly surprise that the pages of Scott Morrison’s little black notebook were heavily etched with the words “free” and “trade” — to be recited in each and every conversation he held. The difficulty for Mr Morrison in a G20 paralysed over whether to take a determined stand against tariff hikes and, most probably, re-emergent protectionism, is that Australia did not. He was left to argue that the only problems besetting world trade are the rules available for appeals when fair trading goes awry. To borrow from Mr Morrison’s beloved NRL team the Sharks, it’s akin to arguing that if a brutal all-in-brawl erupts with opponents centre-field, the remedy is best found in an examination of the rules, rather than naming and binning the pugilists who caused it. By his own admission, Mr Morrison faces a “busy” six months ahead and the international stage will either beckon him again after next May’s election, or render his first “Summit Season” a novel one-off. Either way, whether he or Bill Shorten is up for the next one, there are lessons from this year’s G20 Summit that are instructive to all Australian leaders — standing and reputation on the world’s stage is earnt and accumulated over more than three months. And notebook “scripts”, while comforting, don’t elevate leaders to commanding performances any faster without a solid and coherent foreign policy platform beneath them.